So, I wanted to do a run through quickly of my plans for this space! And hopefully the reveal for it will be this week or in the coming days! Since we all know how much I love a clean, simple and air-y space… I love white. I love white accents, white furniture, etc. It's just crisp, fresh & clean in my eyes. So, my plan for this room will be the following. -Add beadboard all along the wall about 3/4 of the way up and trim out top with a 1x6 more than likely with a ledge. That way I can still lean photos on top or decor but I think it will really make the space pop that much more. -New light fixture… in a perfect world, I'd do oil rubbed bronze finishes for all bathrooms & bedrooms. However, with the slate being in this room…I feel like it would only make it feel darker. Since the bathroom window does not get direct sunlight, since it's located under a porch, we're going to stick with brushed nickel. Still a classic finish and fully beautiful nonetheless! -Crisp white rug that I'm sure I'll be replacing a few times… maybe a light grey or a fun pattern. -White medicine cabinet. I would love to repurpose an old one or DIY one. Still hunting for that piece! -Something for above the toilet… possibly open shelving or a pretty photo. We will see! -Hooks on right side of shower for obvious towel storage! 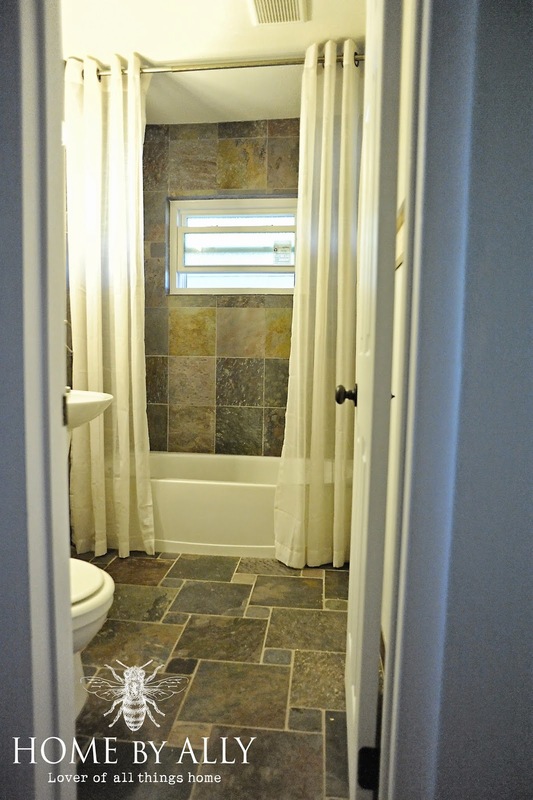 -Fabric to make a pretty shower curtain that goes all the way to the ceiling. I'll either do 95" bright white curtains & add some fun detail…or I'll make something! We shall see! Plus accessorizing the whole space will definitely be the fun and entertaining part! I'm looking forward to bringing y'all along for the ride! So I have a question. 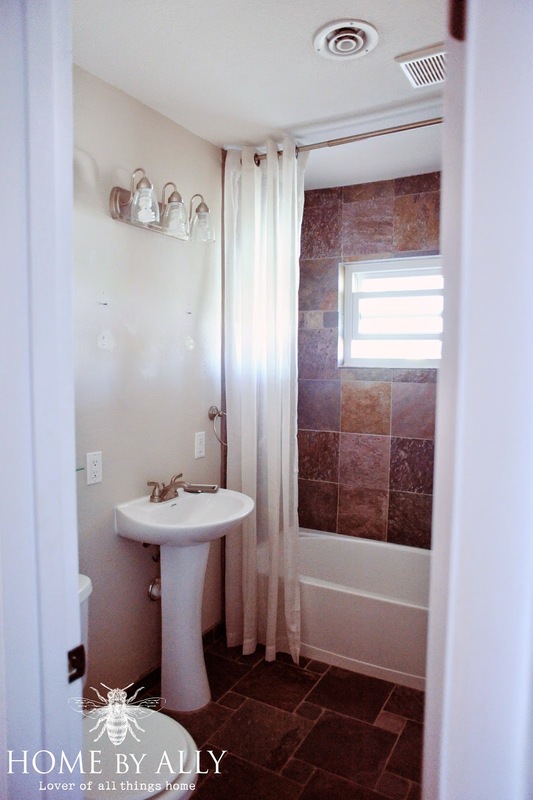 I love how you have the shower curtain hung at the ceiling, but where do you find a liner long enough to tuck into the tub to keep your floor from getting soaked? I have an extra bar hung lower but it is an eye sore, what is your solution?